Our Primary classrooms are specially designed for 4 to 6 year olds. Children are able to move about and choose materials from easily accessible cells. They work on floor mats or at small tables to complete the tasks set by the activity they have chosen to do. One child might paint, while another child places beads into groups of 10 to perform a multiplication function, while at the same time, the teacher might be giving a lesson to a small group. In such a natural setting of mixed age children, the younger children learn from their older classmates, while the older children reinforce their knowledge by working with younger children. 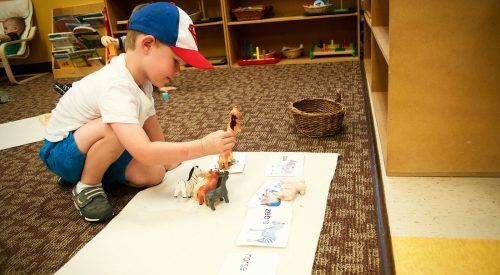 The goal of our primary curriculum is to help the child develop a mastery of self and his or her environment. The tasks that are available to the children are broken down into 5 areas of learning: practical life, sensorial, math, language and cultural sensitivity. 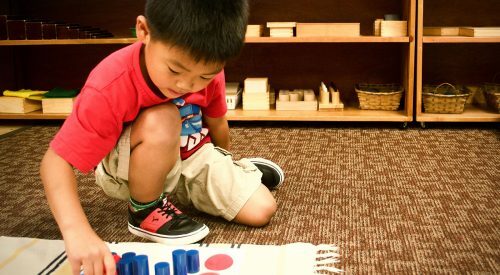 A key principle that underlies and guides activities in a Montessori classroom is respect. Adults respect each child as an individual and unique learner. Children learn to respect not only their elders, but also each other and the learning materials through the lessons of grace and courtesy and the exposure to positive role models. Although a part of every day is devoted to individual work, children also enjoy social activities such as singing, storytelling, and outdoor play in order to make sure that they receive a well-rounded education. Older children will also begin learning a foreign language in this classroom.